The fall of light and shade. And blue the hill radiates the ray’s fall. With the nightjar’s quivering wing. And an unknown traveler’s dusty tread. Lies open-eyed under a vacant sky. Slowly drawn into the slanting line of sight. All hills are the same. All valleys too. And seeped into its very being. Or where they both end. Thrown over the flames of the sun. What is there to choose between? In a statement put up on its website, the US Consulate said: ‘Yesterday (Friday) at a Study Abroad Orientation Program at SRM University, Vice Consul Maureen Chao gave a speech describing positive memories from her own study abroad experiences in India 23 years ago.’….Chao said when she came out of the train after the journey, her skin got dusty and dirty and, after a pause, added that ‘I became dirty and dark, like a Tamilian’, landing herself into an avoidable controversy. R. K. Narayan, the Indian writer in English, has an excellent essay on drinking coffee. During one of his sojourns abroad, when asked by his white hostess at a fast food zone, quite innocently whether he wanted his coffee black or white, the writer suddenly became self reflective. Why black or white, why not brown, like our south Indian coffee, served with sugar, hot and steaming? After all, why should there be such a strong demarcation between white and black? Aren’t we conveniently ignoring the gray/brown area wherein the two intermix and commingle? Narayan’s musings are indicative of a serious issue that cuts across culture, land and history. The question of black and white and black or white still resonates in our midst—Black or White? In Pondicherry, for instance there is a clear-cut demarcation between the white town and the black town. Although people actually seldom refer to the non-white part as black many do take pride and prestige in referring to the white area as White! This as with many other things in this part of the world reveals but the colonial hangover that still persists in us even after the last English or the French or the Portuguese have left, whether it is Goa or Pondicherry or the rest of India. The shadow of the Raj still looms large and the white or black question as yet persecutes us—sometimes overtly as in this case, and at other times covertly, quite subtly, nevertheless, profoundly. Eitherway there is a certain hegemonial precedence and preference for white as something more desireable and valuable. The world is host to a large number of people of different skin textures, They think differently respond differently live differently dependent for the most on the geography of the part they inhabit. Of course human beings have evolved differently in different parts of the globe. Even if Darwin were right not all apes evolved into humans that’s for sure! Some evolved faster some a bit slower and some have been stunted in their growth. Just as animals and birds vary according to climate and altitude and nearness to sea or mountains, human beings also vary. In any case, no element in nature is essentially or intrinsically more valuable than any other! Nature, in all democracy, has been benign in granting this conglomeration of innumerable elements and chance – that is life– with sufficient protective measures and survival strategies inbuilt, not in any way, qualitatively superior or inferior! Skin is therefore not a mere outer cover it is an intimate part of nature—perhaps the very point where outer nature begins permeating into our inner nature! And making distinctions of difference based on that is so very unnatural! Basic Science tells us that it is the chemical substance melanin that supplies the pigment: less or more of its presence makes for dark or tan or fair colour of skin. Where there is abundant sunlight the skin colour goes darker, the lesser the sun’s rays the fairer the human skin. Just as animals and birds have evolved different textures and colouration in different parts of the world humans too have evolved differently. This obviously has nothing to do with high and low culture nor does it have anything to do with ranges of beauty. However the common man and woman are made to believe that the fairer the skin the more attractive it becomes! Such imbecility! Such simple brains that innocently fall prey to this belief! No one perhaps pauses to consider the tremendous varieties of skin textures in the world that range from pale white through yellow, chocolate brown, deep brown and deep black. Each people have their natural requirement, of course barring those with biological disparities. The entire cause and concern for fairer skin as a sign of greater beauty is certainly farcical. As with many things beside, our contemporary world is deviating from sense and virtue quite frequently! Some clever brains would argue that white has always been considered to be pure and black its opposite, as contaminated and impure. Much could be said in favour and disfavour of this argument. History and myth are of course human creations. There are many exterior and interior factors that often go into the creation of each tenet of human belief, whether it be legendary or facets of history. There is a Vedic mantra that goes like this: asato ma sat gamaya, tamaso ma jyotir gamaya, mrtyor ma amrtam gamaya! ( usually this is translated as: lead me from untruth to truth, from darkness to light and from death to eternal life!) One is tempted to equate asat (untruth) and mrtyu (death) with tamas (darkness). However, on closer scrutiny one recognizes that the prayer could also be read to indicate the passage through untruth, darkness and death into truth, light and the eternal state. They are not mutually exclusive binary categories, but mere extensions that are complementary to one another. Dark tan and light tan are naturally necessitated skin pigmentations. Discriminations based on that are inhuman and unnatural. Worse still is the situation of the poor dark skinned folk who are made to believe that theirs is qualitatively lower kind of skin and so rush to whiten the same using the unguents of the capitalist markets! Perhaps such is the force and power of the strategies of Capitalism that they are blinded to truth and act in conformity ever so willfully! The presence of the colonial hegemony is not far to seek. Black is opposed to white as undesireable. Then of course brown is a shade less preferable. Our south Indian coffee is brown—neither black nor white. But few pause to seek the differences in taste and life alike! But just an inspector of police. Hides his face for shame. Breaks over rain-wet plantain leaves. With what can the drummer drum? With what can the piper pipe? Where is that Carpenter of Malgudi? 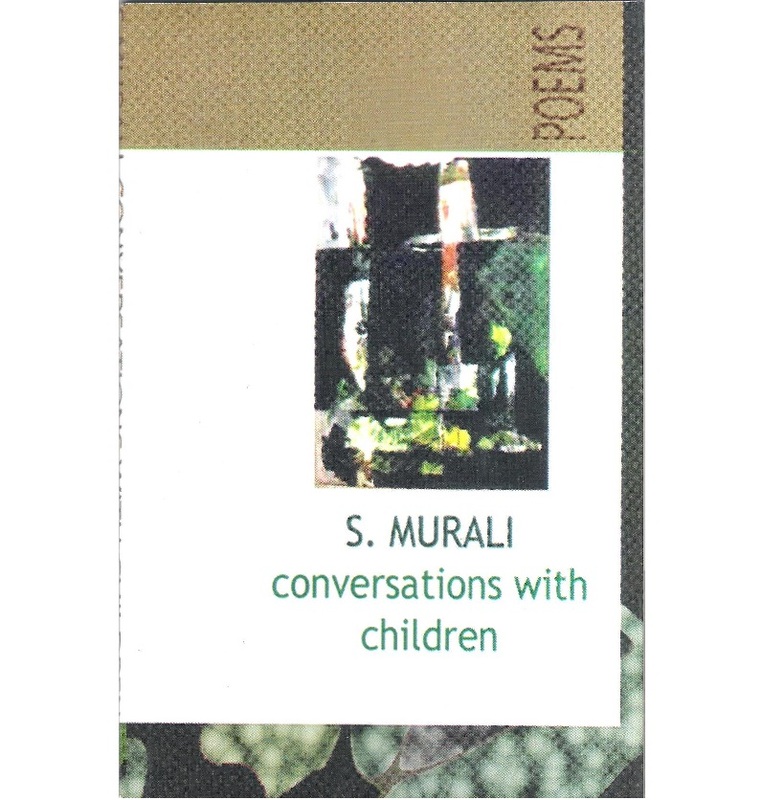 Does Malgudi have a Policeman? The unconcern of the gods? In experience. And Narayan, in words. In flesh or in fiction. Of men, machines and metaphysics. Nor are they out of it. Wonders never cease—all is eternal. Life’s designs are too obscure from below. Desire, tragedy, all that is this life. After the mud pot is shattered. And the space at last becomes one. And heavy in the evening sky. Once more the fire, the air. I tell the truth. I tell it right. I have slept with infidels before the idols of the pagoda. I am the pangs of the jealous, I am the pain of the sick. I first heard about Silent Valley in the summer of 1976, while I was registered as a Graduate student in Trivandrum. My college was a premier institution in the state and the country considering its stupendous history and the large number of scholars and intellectuals who had sauntered across its portals in the years of yore. The University College had celebrated its centenary and more by then. As they used to say in the small laid back city this was the college to grow up in! Those years were also years of tremendous change and political upheaval. Every second student I met there had an ideological point to debate and prove. The teachers who came to the classes were also equally intelligent and committed (or perhaps gave such an impression, or even appeared thus to my youthful imagination.) It did not appear strange to me that our professor of English turned out to be an accomplished ornithologist and I recall the many hours we chatted about pelicans and pigeons and edible-nest swiftlets, while he did have some spare time away from the classes and other work. The red brick-walls of the old British style building were built to last any amount of student unrests and rebellions apparently because I had witnessed quite a number of those during the years I spent there. The bird-watcher professor was always quite nonchalant and unmoved by those million mutinies and kept on lighting up his non-filtered cigarettes one after another. He was a confirmed skeptic and was quite derisive about student agitations. The song of a bulbul or the call of the White-breasted Kingfisher was no doubt more capable of creating ripples in his sardonically cynical mind than any number of political happenings. He was the President of our Kerala Natural History Society organized in the lines of the Bombay version of the same. We used to get together during the last Saturday of every month in the Museum campus under the trees or when it rained during the persistent monsoon days in the damp up-stairs rooms of the silent citadels of a colonial era. Nature was our concern and ecology and conservation our subject. It was then that I came across the Silent Valley debate and the time and age were so volatile that soon I was sucked into the maelstrom of one of the first ever people’s movement for environment in India. Silent Valley was a passion, it became the icon and symbol of what we humans were about to lose forever on account of the wayward march of uncaring science and technology. The whole project of development was something I came to detest and deride. The very idea of the city and its ambience was what I came to identify with the inhuman policies and projects of the imperial west! When one is young one’s thoughts are pretty fast and the youthful brain adapts easily to the ideas of resistance to authority and power. One arrays oneself always with the underdogs and identifies everything else as potential threats. For my enthusiastic mind urbanization appeared as some kind of Americanisation, and technology that ushered in the terrible change figured as the juggernaut of maldevelopment and calamity. The very name Silent Valley was enough to evoke the idea of greenness and solitude, tranquility and serenity. Over and above it when I came to know more about the policy of the State Government to build a dam across the placid water of the deep jungle stream—the Kunthi river—I was determined to throw in my might to save all that I stood for at any cost. 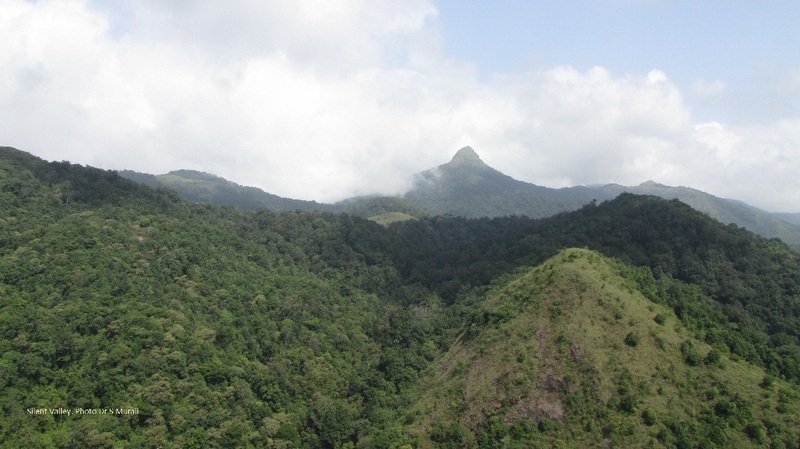 I trekked the hills and mountains of the western ghats sometimes with friends and fellow naturalists but mostly alone. Many of those few close friends I had in the literary artistic circles thought I was a freak and started keeping safe distances from me. And yet there were a handful who sympathized with my view and I soon found myself drawn into a larger circle of committed young people like me. Then came the wild-life week celebrations. The State Department of forests also came to our aid and sometimes provided some sort of help. During one of the ubiquitous poster exhibitions of those days I was awarded a bird-book (The Book of Indian Birds) by our President in the presence of a few committed naturalists and wild-life enthusiasts—and as he proclaimed it, it was in return for the single-handed service I had rendered for the social awareness raising campaign ( A few months later the great legendary Salim Ali himself autographed it for me! And imagine my delight when I had the occasion to do birding with the great man in the Ponmudi hills near Trivandrum afew days afterwards!) Life was so much in the fast lane those days (at least for some like me) and much was happening beside the valley issue. The political emergency clamped on the country by the then prime minister Mrs Indira Gandhi was crucial and critical in the way of our growing up. No one was allowed to protest and there was little one could do by way of resistance. Mrs Gandhi herself was a sensitive soul when it came to issues of conservation and preservation, as I came to realize, but the political climate of those days inspired innumerable young people to take to the streets and be tortured and martyred—apparently for no significant purpose. This might appear no big deal to the youth of today so very used to terrorism and needless political massacres. But then protest and resistance were the order of our youthful days! And Kerala was a hotbed of soico-political and cultural action. However, there were many so called pretentious intellectuals who hid themselves away from the prying eyes of the Gestapo-like police force of the ruling powers that be. Strangely enough many of them made it big in some way or other in later days, conveniently forgetting those times of struggle in the darkness. I can recall a couple of instances when as a student I had occasions to witness the dastardly and cowardly actions of some so-called intellectuals who later paraded themselves as big shots and culture-vultures! Julien Benda had rightly dubbed such situations as the betrayal of the intellectuals. And then there were other mean minds that played havoc with several innocent younghearts who were absolutely unaware of the profound political intrigues of the times and their deeper significance. They would organize some action rally or other forms of activities like street plays etc and parade the unknowing innocent victims in the forefront while hiding behind their shadows lurking and ducking the vigilant police and political spies. How many times did I fall prey to these dirty games that these political big-wigs played! How many dark nights and sleepless dawns did I tread the erroneous by lanes running reckless errands for these uncaring scoundrels! The worst thing was that I had carried out all these under the pretence that I was doing something heroic! And growing up in those dragon-ridden days and nights I had played out my active part in the dram of the silent valley too. We got ourselves organized as a society calling It the Save Silent Valley Society. There was an equally involved student of Engineering with whom I struck up a good working friendship. The two of us were the conveners of this society. We sent out a call for a public seminar and proclaimed our intentions to create an open forum to bring the great intrigues into the clear light of day. There was also a specially mounted exhibition that displayed posters and photographs depicting the facts and figures of the silent valley issue. On the date of the rally and march the court issued an injunction order and it was announced that anyone found defying the court order would be punished—the rally was called off. But a few enthusiastic friends had decide to take out a march to the government secretariat silently holding forth placards and their mouths covered with handkerchiefs symbolizing the imposed silence. Many were arrested and the march disbanded cruelly. Some of my friends forcibly locked me up in the exhibition hall to keep me safe from being arrested. I don’t actually know what happened except through the newspapers that carried detailed reports daily. There were of course no television or cell phone in those days—and anyway we were too poor to afford to buy even a book or a journal: the ubiquitous newspapers came and went. And days moved onto nights and darkness made way for the next dawns. The people’s movement had caught on and there were many hands to carry the placards and prepare the posters and many mouths to spread the message. The Kerala Sastra Sahitya Parishad the people’s science movement in the state had taken up the issue and another organization came to be founded: the Prakriti Samrakshana Samithi (the people’s association for the protection of nature) Leading poets, intellectuals and cultural acitivists came to take up the flag from our tired hands and the burden of saving the valley came to be the problem of a larger community of sensitive people. The silent valley was silent no more. It was a burning issue and vociferous political problem debated and discussed by thousands and millions not only in Kerala but all the way from Gujarat to the far eastern states and from Kanyakumari to Kashmir. The desecration of the valley symbolized the perilous avarice of the human beings and its deprivation signaled the disappearance of an all-time green soul from the human body. The silent valley was a passion in my youthful mind and its memories are even now ever-green, and will be like that forever, even after I pass. Three decades after that when I visited the place, I lugged with me the dead weight of a long lost past. I walked down the much trodden path into the green jungle and trampled carelessly over brown and yellow leaves and rounded boulders. The rush of the forest stream had not lost its power and passion. The wild breeze taunted me with the touch of evergreen green deeps. Occasional bits of blue sky showed through the rich verdance of the west coast tropical wet evergreen rain forests. 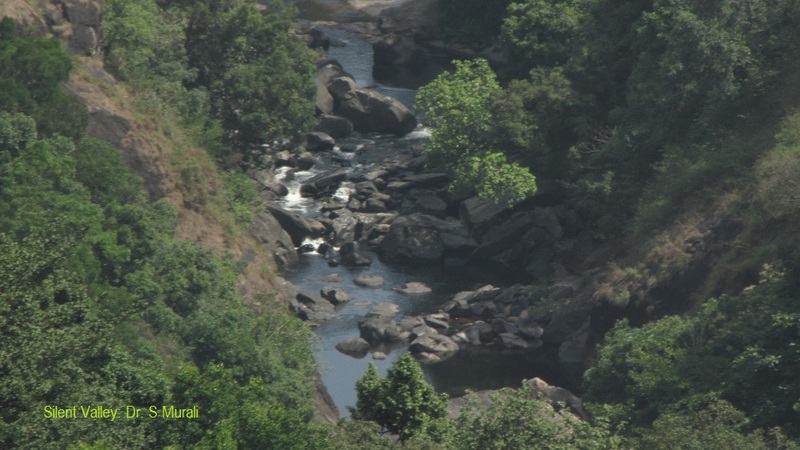 I had forgotten even to wet my feet in the swirling waters of the Kunthi river. Did I hear the whistling thrush mock me for attempting to stop the building of a dam across these waters? Who can resist the juggernaut of change? When I left the forest I fumbled in my pockets for the change I had brought along. I pulled out a clutch of currency notes but no change! I realized I had lost the coins in the jungle. The deep-chested whoop of the Nilgiri Langur floated down wind and a Sambhar stag bellowed. An old friend who had spent long years in Russia had told me that whenever the Russians leave a place where they want to return later they fling a coin behind their backs. The magic of the lost coins would take me again and again to Silent Valley! Who knows! At least, there is still a valley one could think of going back to. A tiny bird is perching on a prickly bush. And the sea pauses as if to catch its breath. Across the grass and sand. All ways are new and newer, yet. Only to vanish. Inversely proportional to the aging heart. The tree from its roots, the earth from the sky. Why should one be tied to thinking at all? Safe in a child’s brain the world would have slept better. Knew this and a little more—he sleeps yet with one eye open. Of life breath, no easing out, but a heavy sigh in the dying air. That dances in the rain? Why is the sky so dark? Why is there no one in the abandoned beach? Where is the monsoon moon? The prickly bush is alive with the nameless bird once again. The abandoned beach stretches till sky swallows the edge. The sea is once again heavy with the scent of death. Strange organisms glitter and vanish on the night’s curving edge. A bat’s soft wing brushes across my shoulder. A man’s life is measured merely in terms of relationships. A sheer bundle of contradictions. Are never quick enough not to be killed. For our space ensured safe on the globe. Or what is disaster for? We be quick, we be nimble. The river was quiet. No bird sang. A few dragonflies danced round. The river paced silent, no wind stirred—yet. The sun had not yet set. To the soft touch of another spring. And to chronicle my past these dead leaves. In the distance, huge trees and history. The greatest disgrace in the present is to continue to be an intellectual and still be alive! I mean it, believe me! Many years ago I came across Julian Benda’s great work of that name– The Betrayal of the Intellectuals —a friend drew my attention to it. The title itself was quite catchy, and I consumed it with the passion of an Indian intellectual of the seventies! I could not disagree with Benda’s arguments although couched in the logic and rationality of another culture, another generation. Nevertheless, how is the situation different in the present? Those who know are also those who keep up with the rest and in perfect silence. Those who know just toe the line of conventional living. Yet, after such knowledge what forgiveness? I recall that it was Sir Herbert Read who introduced Julian Benda’s book to the British reading public. Read who had authored such great works like The Meaning of Art and The Philosophy of Modern Art, himself, might have felt the pressing need to reread the book in his own times! Benda’s main point was that the intellectuals were willfully subscribing to the signs of the times, and toeing the line of the established order despite their conscience. And that’s the greatest betrayal of all! I guess that is the order of the day even in the dismal present. Perhaps it is the spirit of the times that demand perfect compliance and acquiescence! After all, it is easy to accede. Much madness is the divinest sense/ Much sense the starkest madness, writes the American poet Emily Dickinson. Dissent, she says, then you are considered dangerous, and straightaway handled with a chain! I am perfectly aware that I can recourse to the tremendous energy of Sri Aurobindo’s action! Remembering the life and times of an extraordinary intellectual, mystic and rishi, who gazed unflinchingly at the face of truth, history, reason and life. But however, how am I to act in troubled times like the present? Aren’t I also an accomplice in betraying the people? Knowing fully well the consequence of my silence I continue to exist in poignant silence and watch all the misdeeds and atrocities of the cut-throats who parade the present day world’s active stage. Perhaps, my role is simply to bear witness to tragedy and misdeeds? Like Ceslaw Milosz, who wrote A witness to Poetry? I, a poet and painter, simply bearing witness to all the acts and misdeeds of the present, silently, compliantly? Can I act? Need I? What is action? Troubled times, these, no doubt. People are floundering without radical guidance and leadership. They dance to the tune of idiots and scoundrels who somehow manage to stray into the lime light through lobbying, cold shouldering and hobnobbing. They meekly follow the strange gods of science and technology without bothering to stop to think for themselves and seek the truth. Without bothering to ask the right questions. Without critical inquiry. Take the case of development and urbanization: things are happening at such a brisk pace that no one knows when our cities are going to collapse! We live such un-ecofriendly and uncaring a life that we are not sure wither we are heading or at what extreme cost. Development has come to be synonymous with excessive urbanization and westernization, in more ways than one—Americanisation! Our younger generation is floundering on the brink of chaos and unreason not knowing or even caring wither they are headed. Our so-called self-styled experts are as yet unsure of their own lives and are absolutely incapable of showing any directions to even their own off-springs let alone the others who simply follow them unquestioningly. The world is shrinking day by day, the resources are fast depleting in an awfully geometrical scale, and the earth’s atmosphere is becoming so dreadfully contaminated and polluted. All this despite the professed claims of the ubiquitous IT experts to information revolution! [ Whose information, what sort of information, who benefits from what—these are apparently irrelevant questions!] Our very air, water and earth are all poisoned! Death prowls about and around us. There is hardly any escape for us from this our lonely planet. And now over and above all these we do not cease fighting among ourselves for such silly reasons like religion and skin colour! Our identities, as Amartya Sen aptly pointed out, apparently revolve simply round our religion and skin colour in the present! Where does it all lead? What is terrorist action but the blind self exterminating action of a generation that has lost its footing, a generation that does not even recognize that it is mislead and has already allowed itself to be trapped in the jaws of hell? We blame religion and science for our own silliness. We blame nature and environment for our own misdeeds. We blame the other for what are essentially our own mistakes and culpabilities. No one among us stops to look in. Well, no one has the time to either. And of course no one tells one to look in before looking without! This is where the betrayal of the intellectuals occurs. Those who know should necessarily tell those who do not know. It is their duty. If needs be those who know should enlighten those who are ignorant. Tasmat jagrata, jagrata, said the wise Sankaracharaya, therefore, be aware, aware! [I feel like reading it as beware beware!] If they remain silent, the people would be led astray by the prophets of evil and doom. And the silly people are always eager to be led rather than remain free and think. It is the intellectual’s bounden duty to scream the truth at the top of his/her voice, like the child in the story of the emperor’s new clothes! Bold and committed to uttering the truth and nothing but the truth! However in these dragon-ridden days the very foundations of our culture and living are shattered and apparently lie in shambles beyond redemption. Who will take the pains to reassemble the broken order? Who is there to bell the proverbial cat, at any great risk? Culture is not something monolithic or single—it is multifaceted and dynamic. A people’s culture is equally well-rooted in their history and land. It transforms their lives with the times and is transformed in turn. So, how could one speak of a wrong cultural turn, which needs to be corrected and re-directed? Isn’t it a sign of the totalitarian state and its belief that lies at the root of such an argument? If the people choose to live in one way and follow that path for what it is worth, it is their choice and destiny! Woe befalls the one who stops to redirect the turn and tides of popular history. Arguments like these are, however, theoretically unsophisticated and simplistic. There is always history and history! What is apparent to the common folk at the outside is not always the force that controls and manipulates the movements of their history. Nevertheless the common man and woman behold the surface factors and believe they see everything! Take the simple instance of popular culture and taste—in fashion, cinema and television. Those who do not stop to think and exercise their critical acumen, would fall easy prey to the vile and guile of the surface being that betokens the very existence of these aspects of popular culture. They would simply be mass-consumers of these poisonous byproducts of our market consumerist culture! This is not to demean the significance of either fashion or cinema—they are definitely important. My attempt is only to highlight the uncritical consumption of these. If the contemporary gurus proffer these collective dream tokens as panacea for all the evils of worldly suffering our unthinking consumers do not even pause to observe the hidden agenda of global capitalism and market economy. The entertainment industry as it is called hides behind the mesmerizing dragons of tomfoolery that are paraded on the most popular media screens—be they contemporary popular cinema, television or on the Internet. The thinking individual is dead and a thing of the past! Even literature, art, and the theatre—those very media by virtue of their very existence should be the beacons of hope for the continued living of human beings—apparently have lost their directions and are fumbling on the edge of consumerism. Thinking as a human being has been simply dislodged as meaningless act—the history of unreason that Capitalism and its market strategy has unleashed in this world has managed to drive the last nail on the coffin of humanism. Granted, the vagaries of European and American history have revealed the hollowness behind the visage of the human being. Nevertheless how could one stop thinking as a human being? History has shown us the devils of cunning that have led our thinking astray, how even communism—that last hope of the human being—could evolve into meaningless fascism and totalitarianism. The capitalist gurus take delight in drawing our attention to this fact—they glot over the death of global Marxism, forgetting that those experiments that failed signify but the erroneous ways of implementation of a profound ideology, not the ideology per se! The times are now ripe as always for the wrong gurus to take lead, where angels fear to tread! Fundamentalist forces sweep the globe, amateur gurus parade shamelessly as experts and miracle sellers, offering instant cure through yoga, religion, and worldly (certainly expensive!) advice. All the while the knowing ones play dodo and remain concealed in the background, relishing the profits of a pleasure-oriented culture! Julian Benda is quite relevant. What could be more poisonous than this deception? Where is the hemlock?